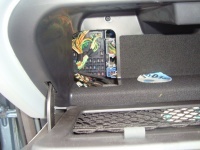 The passenger bay fuse box is locate inside and at the LH rear of the passenger bay glove compartment (UK Cars). There is a cover with a clip at the top and you should press down and gently pull the plastic cover away. 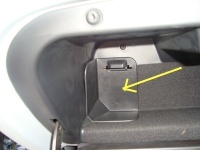 In Left Hand drive cars, the internal fuse box is tucked away on the drivers side roughly where your left knee will be when you drive, it's a little difficult to find, you will need a tourch. Internal view of fuse box. Fuse Location for Passenger bay fuse box. F60 Mini 20 Yellow Power windows left-hand. F61 Mini 20 Yellow Power windows right-hand. F62 Mini 7.5 Brown Rear fog lights. F64 Mini 7.5 Brown Left-hand - front side light, side markers, rear tail lights. F66 Mini 30 Green Left-hand power seat switches, heater module, lumbar pump. F67 Mini 5 Tan Battery back-up sounder, transit relay, HID/dip relay, automatic transmission control module. F68 Mini 15 Blue Cigar lighter. F69 Mini 7.5 Brown Telematics display, In-car entertainment head unit, antenna module, navigation module, VICS (Japan), parking aid, amplifier premium 1 system, phone handset, phone power supply module, instrument cluster, PATS module. F70 Mini 30 Green Right-hand power seat switches, heater module, lumbar pump. F71 Mini 15 Blue VICS (Japan), telephone transceiver, telephone handset. F72 Mini 15 Blue Radio head unit, CD player, navigation electronic control module, diagnostic connector/OBDII connector. 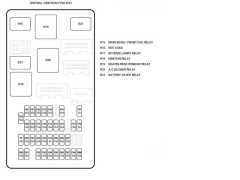 F73 Mini 15 Blue Sunroof unit/module. F74 Mini 15 Blue Instrument cluster, Premium ICE amplifier unit. F75 Mini 7.5 Brown Mirror fold back module, battery back-up sounder, air conditioning ECU. F77 Mini 7.5 Brown Left-hand and right-hand heated seats modules. F78 Mini 5 Tan Phone power supply. F79 Mini 10 Red Automatic transmission only: Reverse lights, reverse light switch, reverse park aid, electrochromic mirror, instrument cluster. F80 Mini 7.5 Brown Park interlock, heater switch, OBDII, blower relay. F81 Mini 20 Yellow Fuel pump control module. F82 Mini 10 Red Variable power steering, alternator. Manual transmission only: Reverse lights, reverse light switch reverse park aid, electrochromic mirror, instrument cluster. F83 Mini 15 Blue Not used. F84 Mini 5 Tan Instrument cluster, passenger airbag fascia light, seat weight sensor. F85 Mini 7.5 Brown Right-hand high beam light. F86 Mini 7.5 Brown Left-hand high beam light. F87 Mini 15 Blue Front Fogs master light switch. F90 Mini 7.5 Brown Stop lights, cruise control. F91 Mini 10 Red Sunroof, electrochromic mirror, power windows, power mirrors. F92 Mini 10 Red Manual transmission cruise control clutch switch, ignition coils, automatic transmission rotary switch. F93 Mini 30 Green Windscreen wipers. F94 Mini 20 Yellow HID module. F95 Mini 10 Red Airbag restraints module. F96 Mini 7.5 Brown ABS module. F97 Mini 7.5 Brown Glove compartment light, instrument cluster lights, licence plate lights. F98 Mini 10 Red Mirror heaters. F99 Mini 10 Red Luggage compartment light, footwell lights, puddle lights, vanity mirror lights, interior lights, aircon control unit, roof console unit.